When choosing the storage for your loft you will probably find, that it is almost impossible to find the wardrobe or chest of drawers that would fit the slopping ceiling. Lofts can be considered an idle space if not used. Converting your loft into a room is an innovative way to maximise the use of space in your house. Lofts can be converted into a bedroom, a game room or even a home theatre or home office. This is one novel and economical way of creating more functional space in your house. Having the made-to-measure wardrobes in your loft might be the most practical way to make your loft a cosy and useful space. 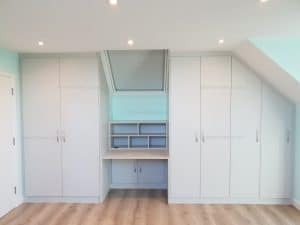 Fitted loft wardrobes are designed to impeccably fit into the form and contours of the loft, to effectively fill and utilise every available space. In case you are converting your attics into home office, matching bespoke table can be created to compliment the fitted bookshelves, drawers. The major benefit of having a modern loft wardrobe is the creation of functional space for storage which could otherwise be left as a futile space that only gathers dust. In creating storage, you benefit from the orderliness bestowed by having an ideal storeroom for you clothing and shoes. And since the loft is not necessarily within the perceptible areas of the house, you will enjoy a sense of cleanliness or neatness around you. The installation of the loft wardrobe on the other hand, frees space in the more accessible areas in your home. This could translate to bigger space for you bedroom or your living room. Using a free standing cabinet wardrobe would leave a lot of unused space and make your room space smaller. Creating your own style is integral in loft wardrobes because loft wardrobes entails custom configuration to fit the roofing idiosyncrasies of individual homes. Thus, having a fitted wardrobe is really a chance for genuinely customising or creating a unique interior feature.